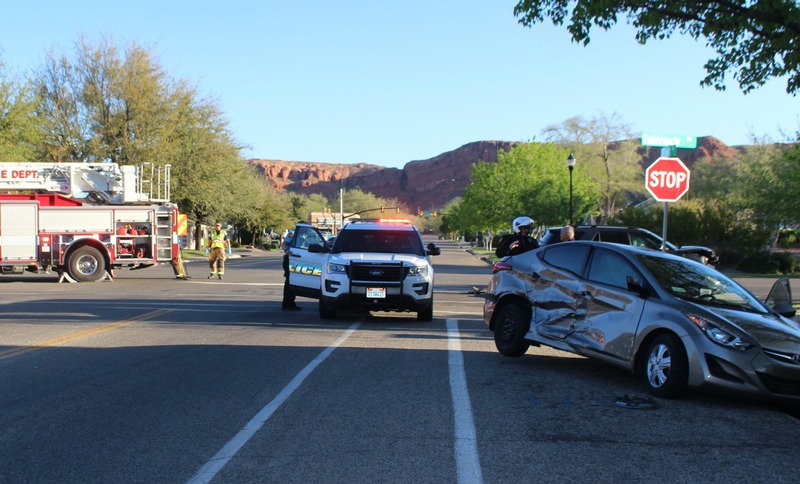 ST. GEORGE — Minor injuries were reported in a T-bone crash on Tabernacle that blocked traffic and sent two heavily damaged vehicles to the tow yard Thursday morning. 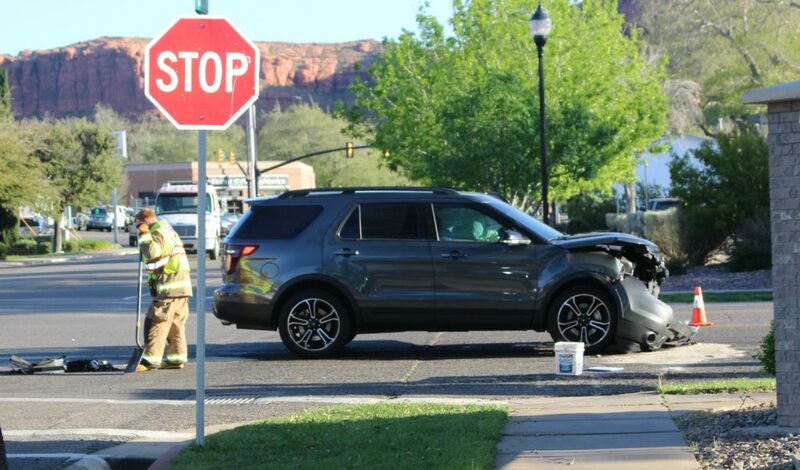 At 8 a.m. officers and emergency personnel were dispatched to a two-vehicle crash at the corner of 300 West and Tabernacle involving a gold Hyundai passenger car and a dark gray Ford Explorer, St. George Police officer Dave McDaniel said. Officers arrived to find the Ford near the median partially blocking eastbound traffic on Tabernacle while the Hyundai crashed into the curb on 300 West. 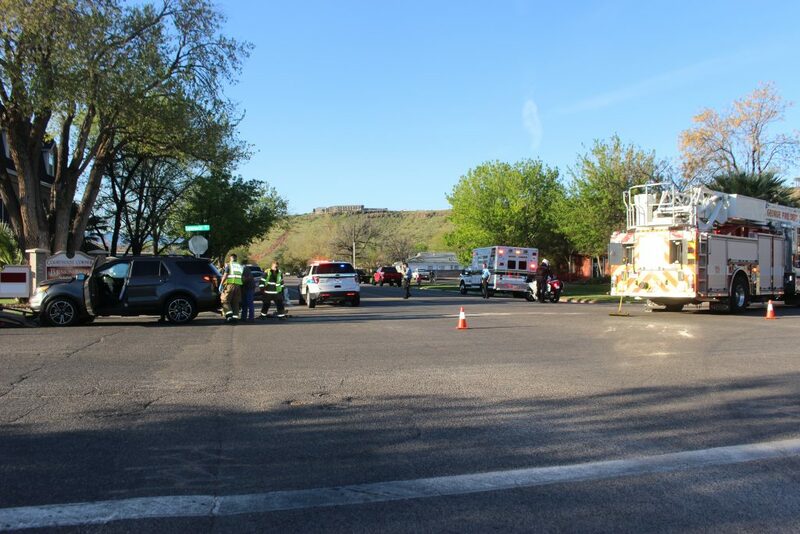 All occupants were checked by EMTs at the scene and reported minor injuries, McDaniel said, but declined to be transported to the hospital. He said just before the crash, the Ford was heading east on Tabernacle while the Hyundai was heading south on 300 West. 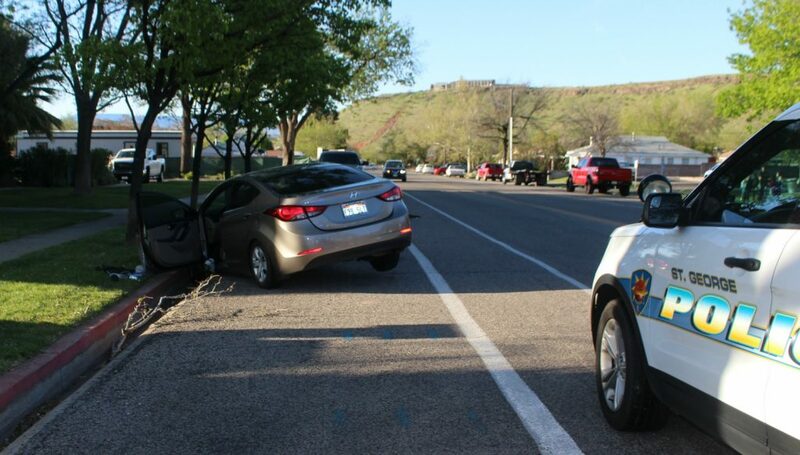 The man driving the Hyundai failed to stop at the stop sign and continued through the intersection “at full speed” and was struck by the Ford as it passed directly in front of the SUV. “The Ford had no time to hit the brakes or anything,” McDaniel said. 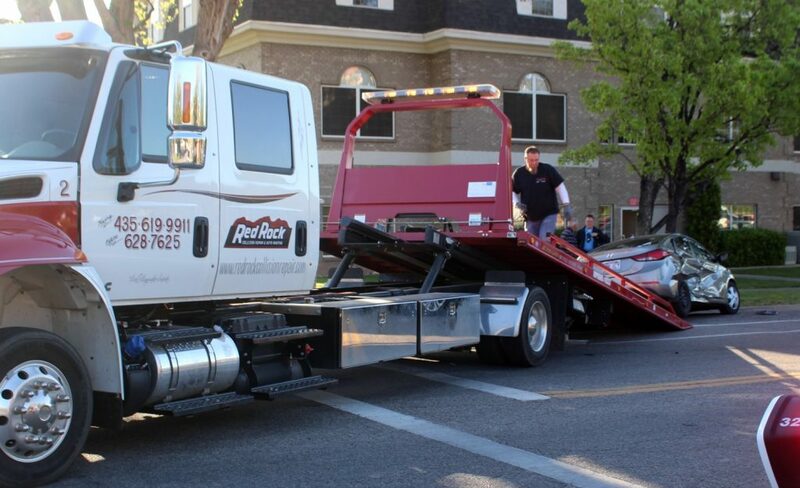 The impact deployed the airbags in both vehicles and spun the Hyundai around and sent it crashing into the curb facing in the opposite direction of traffic. The Ford was left in the middle of the intersection partially blocking the eastbound lane of Tabernacle. The Hyundai driver told officers he thought he was on a different road that didn’t have a stop sign, McDaniel said. 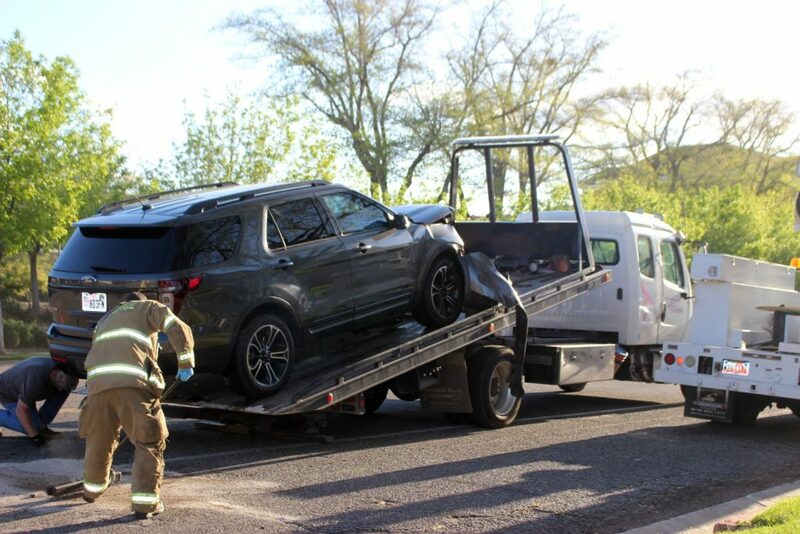 The collision caused extensive passenger side damage to the Hyundai while the Ford sustained frontal damage, and both vehicles were towed from the scene. McDaniel said the Hyundai driver was later cited for failure to stop at a stop sign. 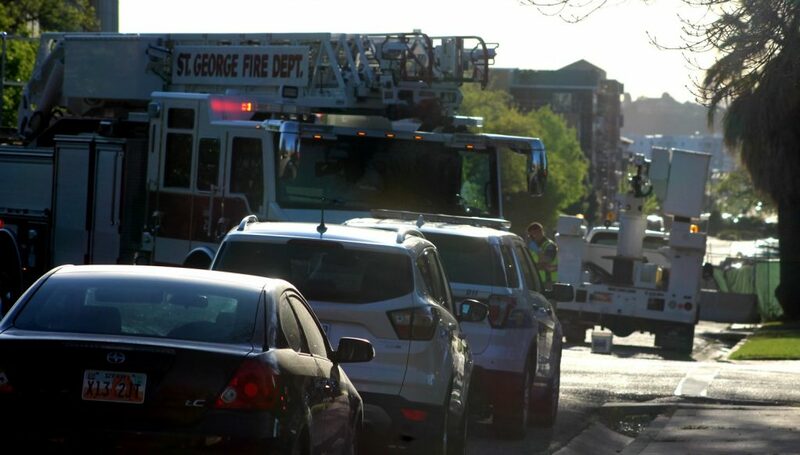 The St. George Police Department, St. George Fire Department and Gold Cross Ambulance responded and tended to the scene.